Vintage From Paul is pleased to offer these Grindley Hercules Vitrified Maroon Black Stripe Luncheon Plates. These plates were manufactured in England. 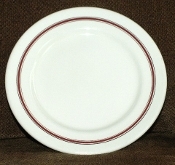 The pristine white restaurant ware body is decorated at the rim with a maroon stripe banded on either side by a smaller black pin stripe. The Grindley Hercules Vitrified Maroon Black Stripe Luncheon Plates measure a generous 9-7/8 inches in diameter. Each of the available Grindley Hercules Vitrified Maroon Black Stripe Luncheon Plates is in pristine condition.